Dr. Robin Osterman is an Associate Professor at the UC College of Nursing and is an adult psychiatric mental-health clinical nurse specialist with specialty certification in inpatient obstetrics. Her research involves the testing of social-behavioral interventions to decrease risky behaviors, with a focus on preventing alcohol and substance abuse in pregnancy. In 2010-2012, she was awarded the Building Interdisciplinary Research Careers in Women's Health (BIRCWH) K12 Award for her study "Motivational Interview to Decrease Prenatal Alcohol Use". Since that time, her research has focused on the use of biomarkers of alcohol use in opioid addicted pregnant women to detect prenatal alcohol use in high risk women and to examine drinking outcomes of women who report histories of childhood and lifetime trauma. Osterman, R., Ammerman, R.T., Gates, D., & Schafer, J. (2012). Decreasing prenatal alcohol use: A randomized clinical trial of motivational interviewing [Abstract]. Journal of Women's Health, 21(10), 996-997. Osterman, R., Ammerman, R.T., Gates, D., & Carle, A. (2013). Single-session motivational interviewing to decrease prenatal alcohol use [Abstract]. Alcoholism: Clinical and Experimental Research, 37(2), 50A..
Osterman, RL (2011). (In Press).Feasibility of Using Motivational Interviewing to decrease alcohol use during pregnancy. Journal of Addictions Nursing, 22(3), 93-102. Osterman, R. (2011). Decreasing alcohol use during pregnancy. Alcoholism Treatment Quarterly, 29(4), 436-452. Osterman, R., Lewis, D., & Winhusen, T. (2017). Efficacy of motivational enhancement therapy to decrease alcohol and illicit-drug use in pregnant substance users reporting baseline alcohol use. Journal of Substance Abuse Treatment, 77(June), 150-155. Osterman, R. L. (10-2005). 6600 Orientation Manual for Nurses. Good Samaritan Hospital Detoxification Unit. Osterman, R. L. (08-2005). Good Samaritan Hospital Mental Health Inpatient Unit Faculty Orientation Manual. Osterman R. (10-2009). Evaluating a Motivational Interviewing Intervention with Women Consuming Alcohol During Pregnancy. Many Differences, One Voice: Practice, Research, Education, Administration, American Psychiatric Nurses Association 23rd Annual Conference ,Charleston, South Carolina. National Awarded First Place in Student Research Poster Division. Sommers, M.S., Fargo, J.D., Ribak, J., Osterman, R., & Lyons, M. (07-2007). Sleep Deficit in Young Adult Problem Drinkers and Risky Drivers. 30th Annual Research Society on Alcoholism Scientific Meeting ,Chicago, Illinois. Osterman, R. (04/10/2010). Motivational Interviewing Intervention to Decrease Alcohol Use During Pregnancy. Nursing Research: Bench to Beside, 2010 Midwest Nursing Research Society (MNRS) Annual Research Conference ,Kansas City, Missouri. Osterman, R. L. (08/08/1992). Presider for session, Adolescent Psychiatric Nursing. ,International State of the Science Congress, Washington, D.C.
Osterman, R. (10-2005). Management of Aggressive Behavior: Crisis Prevention. ,Good Samaritan Hospital Behavioral Health Dept., Dayton, Ohio. Osterman, R. (10-2005). Use of Restraints. ,Good Samaritan Hospital Behavioral Health Dept., Dayton, Ohio. Osterman, R. (01-2005). Turning Anger Into Empowerment: The Use of Assertiveness Training Techniques – Parts 1&2. ,Good Samaritan Hospital Mental Health Inpatient Unit, Dayton, Ohio. Osterman, R. (10-2004). Daily Goal Setting with Patients. ,Good Samaritan Hospital Mental Health Inpatient Unit, Dayton, Ohio. Osterman, R. (05-2004). The Impact of Culture on Mental Health. ,Good Samaritan Hospital Mental Health Inpatient Unit, Dayton, Ohio. Osterman, R. (01/20/1995). Brief Therapy. ,Clermont County Counselors Association, Milford, Ohio. Osterman, R. (05/26/1993). Pregnancy - Adolescent Concerns. ,Colerain Career Center, Cincinnati, Ohio..
Osterman, R. (03/24/1993). Infertility and Perinatal Loss. Parent's support group ,Crescent Women's Medical Group, Cincinnati, Ohio. Osterman, R. (10/05/1992). The Expanded Role of the Nurse. ,The Christ Hospital School of Nursing, Cincinnati, Ohio. Osterman, R. (07/28/1992). Perceived Support and the Use of Cocaine During Pregnancy. Born Free program ,Miami Valley Hospital, Dayton, Ohio. Osterman, R. (05/21/1992). Nursing Care of the Substance Abuser and Chemically Dependent. ,Good Samaritan Hospital School of Nursing, Cincinnati, Ohio. Osterman, R. (05/21/1992). Nurses in Independent Practice. ,University of Cincinnati College of Nursing and Health, Cincinnati, Ohio. Osterman, R. (03/10/1992). Perinatal loss. ,Mercy Hospital-Anderson, Cincinnati, Ohio. Osterman, R. (12/12/1991). Perceived Support and the Use of Cocaine During Pregnancy. ,Perinatal Center, University Hospital, Cincinnati, Ohio. Osterman, R., Martsolf, D, Gillespie, G., Lee, R. (04-2013). State of the science: How it determines your research question (invited presentation). Paper presented at the Institute for Nursing Research (INRS) Educational Forum, University of Cincinnati College of Nursing ,Cincinnati, Ohio. Osterman, R. (04/01/2013). Trauma-Informed Intervention to Decrease Alcohol Use During Pregnancy. Institute of Nursing Research (INRS) Educational Forum, University of Cincinnati College of Nursing ,Cincinnati, Ohio. 2006 First runner up – Presidential Award for Faculty Excellence: Outstanding Lecturer Wright State University, Dayton, Ohio. Jennifer Brubaker Undergrad Advisor Wright State University Honors Project Completed 2005 Raising Awareness of Fetal Alcohol Syndrome Clinical Student graduated with Honors in June, 2005. 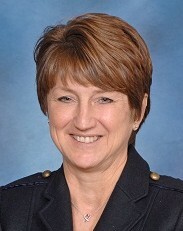 Christine Wilder, MD. 2013 WH2 award Project: To: 1) identify barriers to treatment retention for opiate addicted postpartum mothers in medication-assisted treatment (MAT) and 2) pilot an computer-delivered intervention to improve treatment retention of postpartum women in MAT. Joseph Perazzo Doctoral Advisor Completed 2013 Professional Seminar I and II course. Jennifer Rode Doctoral Committee Member Completed 2013 The Protective Effects of Social Support on Postpartum Depression: Does Emotional Intelligence Matter? Billie Jean Kosak Doctoral Completed 2011 29 NURS - Proseminar II and III. University of Cincinnati Center for Clinical Translational Science and Training (CCTST) Focus Group to redesign CCTST website Member 2011 Invited. American Psychiatric Nurses Association (APNA) Addictions Council Steering Committee Member 2014 to Present 31 members selected from a pool of 255 applicants. Butler Behavioral Health Services Board of Directors Executive Committee 2014 Chair-elect. Flower Power: Thinking of Women's Health Conference 2005 Volunteer. 06/04/2014 Drug Testing in the Neonate, The National Certification Corporation (NCC) Online continuing education module, Contact hours: 10.0. 06/04/2014 Implications of Late Preterm Birth, The National Certification Corporation (NCC) Online continuing education module, Contact hours: 5.0. 06/04/2014 Issues in Professional Licensing, The National Certification Corporation (NCC) Online continuing education module, Contact hours: 5.0. 2012 Introduction to the ethical norms and regulatory issues that constitute responsible conduct of research Required course in curriculum for CCTST Certificate in Clinical and Translational Research. 1 graduate credit hour. 09/05/2009 Experiential Processes and Strategic Approaches in Treating Anxiety: Advanced Intervention Techniques Contact hours: 5.5. Butler Behavioral Health Services, Inc.
2007 to Present International Nursing Society on Addictions (IntNSA) – member. 1980 to Present Association of Women's Health, Obstetrics, and Neonatal Nursing (AWHONN)- member. 29-NURS-704 HP A OB ACCELERATED Level:Graduate Spring, 2010. 5 Graduate credit hours 2nd degree accelerated undergraduate students. 29-NURS-307 CC MENTAL HEALTH Level:Undergraduate provided clinical instruction to Junior and Senior students in their mental health rotation. University of Cincinnati College of Nursing, 2009 to present. Scientific Basis for Professional Nursing Practice NBSN 4062 Instr. Method:Online Level:Undergraduate Fall/Spring Semesters, 2013-2015 – 3 Undergraduate credit hours. Online course introducing RN-BSN nursing students to research process to understand scientific basis for practice and theoretical foundations of nursing knowledge and practice. Course lead/coordinator duties. Developmental Issues in Complex Psychiatric - Mental Health Disorders ANPS 8011 Level:Graduate Spring semester, 2013. Online course transitioning students into the role of the advanced practice psychiatric nurse providing integrative care (psychotherapy, psychopharmacology, and complementary/alternative methods to persons with complex mental-health disorders across the lifespan. Environmental Issues in Adult/Geriatric Treatment ANPS 8002 Level:Graduate Fall semester, 2012. Online course teaching psychotherapeutic theories and techniques used with adult/geriatric populations to psychiatric advanced practice nursing students. 29-ANPS-824 ADULT/GERO MH THERA Level:Graduate Spring/Autumn quarters, 2011, Winter/Spring quarters, 2012. 4 Graduate credit hours. Online course teaching psychotherapeutic theories and techniques used with adult/geriatric populations to psychiatric advanced practice nursing students. Prevention of Fetal Alcohol Spectrum Disorders Elective Spring, 2011.RN-BSN program (Faculty: Janice Dyehouse). 29-NURS-307 CC MENTAL HEALTH Level:Undergraduate Winter, 2010. Provided clinical instruction to Junior and Senior students in their mental health rotation.